We recently updated our Vision Paper, and wanted to share some of the content on our blog. The Internet is censored and restricted around the world. 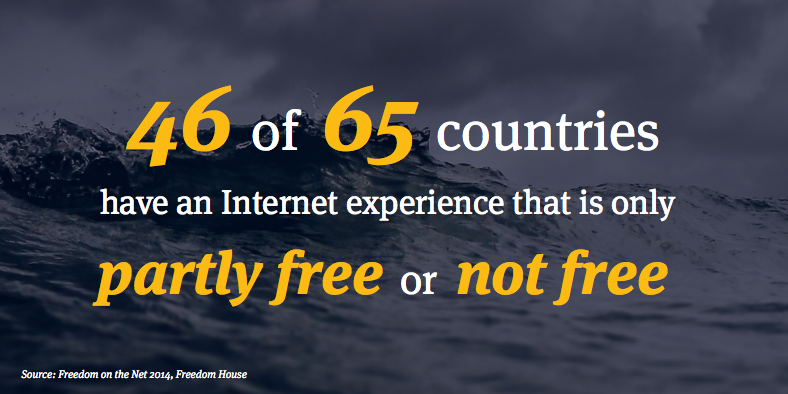 As a result, many people do not have access to the free and open Internet we believe they should. In a 2014 report by Freedom House, a watchdog organization dedicated to the expansion of freedom, it was reported that a large number of the countries examined had an Internet experience that was only partly free or not free at all. Furthermore, Internet freedom was reportedly on the decline for the 4th year in a row. Reasons for the decline include: increase in surveillance, repressive laws, regulations on media usage and cyber attacks. Similarly, Google’s Transparency Report shows that 63 countries asked it to restrict access to certain content in the first six months of 2014. In 2013 alone, Google was asked to remove over 39,000 items from its search results and other sites. These are just two examples of the widespread, increasing Internet censorship taking place around the world. This censorship poses a great barrier to Internet freedom, and we must actively work to combat the trend. At Golden Frog we believe in an Internet devoid of restrictions, and we continually fight for this Internet experience for users. Learn more about our vision for a free and open Internet – Read Our Vision Paper.